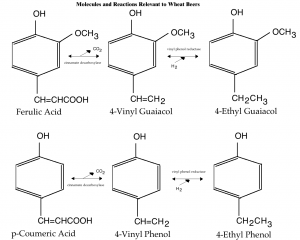 The most interesting bit of chemistry relevant to brewing a wheat beer involves the transformation of ferulic acid into 4-vinyl guaiacol. (The chemistry with regards to the esters, including the “banana ester” (iso-amyl acetate), is the pretty much the same as in “regular” ales.) However, a look at a variety of related molecules — where they come from and what they get converted into — is interesting and may be helpful to brewers looking to track the source of off flavors when they appear. First, let’s start with enough basic chemistry to make this understandable to someone whose chemistry experience is limited. In the molecules I’ll discuss, the atoms that compose them are sometimes shown by their chemical symbol. For example, “C” represents carbon, “H” represents hydrogen and “O” represents oxygen. If there is more than one of the molecules, their count is subscripted. For example, CO2 is a molecule consisting of one carbon (the “C”) and two oxygens (O2). At the core of all the molecules I will discuss today is the molecule phenol (see the second diagram). Phenol is a ringed molecule with a backbone of six carbon molecules, and a hydroxyl group attached to one of the carbon atoms. A hydroxyl group is a hydrogen atom bonded to an oxygen, and drawn as —OH. In the diagrams, the six-carbon ring is represented as a hexagon (a six-sided figure). When molecules are drawn in this way, a carbon molecule is assumed to reside at every point where two lines meet (and hence at the six “points” of the hexagon). Carbons are also implies wherever a line ends (although this doesn’t occur in the diagrams here). Likewise, representing hydrogens with an “H” is optional. The phenol molecule shown could equivalently be represented with a hydrogen atom (—H) sticking from the five points of the hexagon without the hydroxyl group. The carbons in the phenol ring are numbered, starting with at the carbon with a hydroxyl group and continuing clockwise around the ring. An interesting thing about phenol is that it is very reactive. It reacts with many molecules, especially those prone to reacting such that they gain electrons (electrophiles), in a way such that various chemical groups get attached to the ring. Carbon molecules always have four bonds extending from them. In the diagrams, each line is a chemical bond. A double line represents a double bond. There should be four lines (bonds) extending from each “C” or implied carbon. (Carbon is tetravalent, in chemistry lingo.) If there is not, the remaining bonds are assumed to be to a hydrogen (—H). In the case in which part of the molecule is written as a formula (for example, —CH=CHOOH), single bonds are not drawn. Double bonds are sometimes represented by an equals sign (as here); other times they are implied. On the left hand side of the first diagram, you can see two similar-looking molecules, ferulic acid and p-coumeric acid. Both these molecules are similar to phenol, but with a —CH=CHCOOH group at the fourth carbon. Ferulic acid additionally has a methoxy group (—OCH3) at the second carbon. 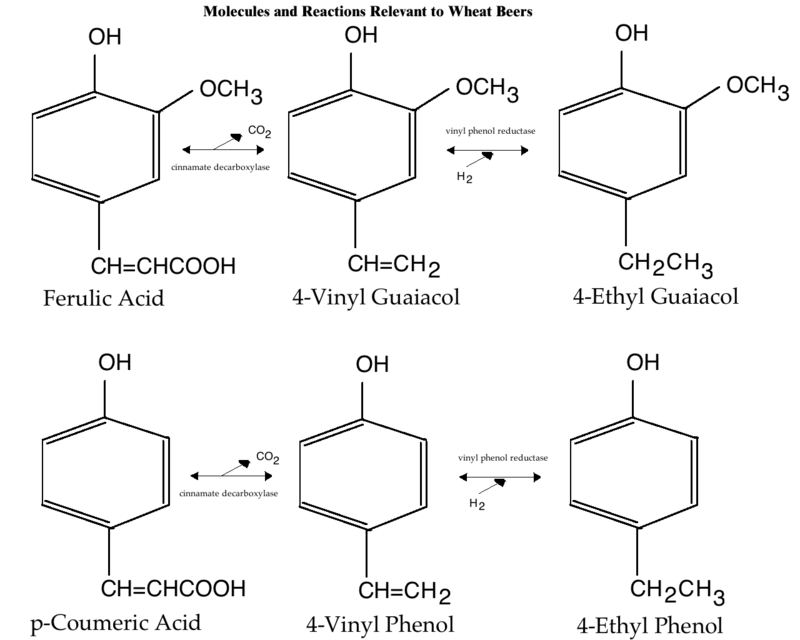 Ferulic acid is, of course, important to wheat beer brewers as the precursor to 4-vinyl guaiacol (4VG). Ferulic acid is found in the bran of wheat and released during the mash, especially a mash with a ferulic acid rest. During fermentation, it is converted to 4VG by the enzyme cinnamate decarboxylase (also called ferulic acid decarboxlase). This enzyme is produced by yeast strains with an active form of the POF gene. These include wheat beer yeast strains, most wine strains and also bread yeast and many wild yeasts. The same enzyme can also decarboxylate p-coumeric acid and produce 4-vinyl phenol. “Decarboxylate” means to remove a carboxyl group (—COOH). p-Coumeric acid is a molecule also found in the bran of wheat. 4-vinyl phenol is a minor flavor component in wheat beer. In normal beers (or wines), if it is present, it is likely due to contamination from Brettanomyces. By itself, 4-vinyl phenol lends a barnyard or mousy aroma, or a medicinal or band-aid-like character. Interestingly, if you were to remove the hydroxyl group from p-coumeric acid, you would have cinnamic acid, a molecule that smells like honey. If you would then attach an ethyl group (—CH2CH3) to the —CH=CHCOOH residue, you’d have ethyl cinnamate, an important component of the essential oil of cinnamon. The enzyme vinylphenol reductase can reduce (add electrons to) vinyl groups attached to phenol and convert them to ethyl groups. This converts the double bond in the vinyl group to a single bond and two hydrogens “fill in the blanks” left by “open” carbon bonds. 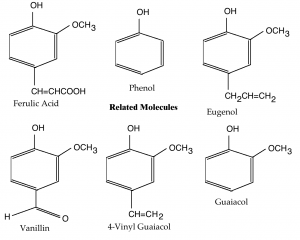 4-ethyl guaiacol is described as spicy, clovy or smokey (and perhaps even bacon-like). It is considered a desirable component in some wines. 4-ethyl phenol gives roughly the same off odors as 4-vinyl phenol and is considered a fault in wine. It is a component of some Belgian style beers, but in more “regular” brews, it is not wanted. In the second diagram, I also included representations of eugenol and vanillin. These don’t play a role in wheat beer production, but their structures are similar to 4-vinyl guaiacol and they are also flavor active molecules. Eugenol is found in the essential oils of nutmeg and cinnamon (as well as basil and bay leaf). It’s the most abundant molecule in the essential oil of cloves. As such it smells like cloves. Interestingly, it differs from 4-vinyl guaiacol only in the addition a carbon (—CH2—) to the residue attached to the fourth carbon on the phenol ring. Vanillin is an essential oil from the vanilla bean, and (of course) it smells and tastes like vanilla. If you were to change the methoxy group (—OCH3) on the fourth carbon, you’d have ethyl vanillin — a molecule that smells like vanilla, but is stronger than vanillin. 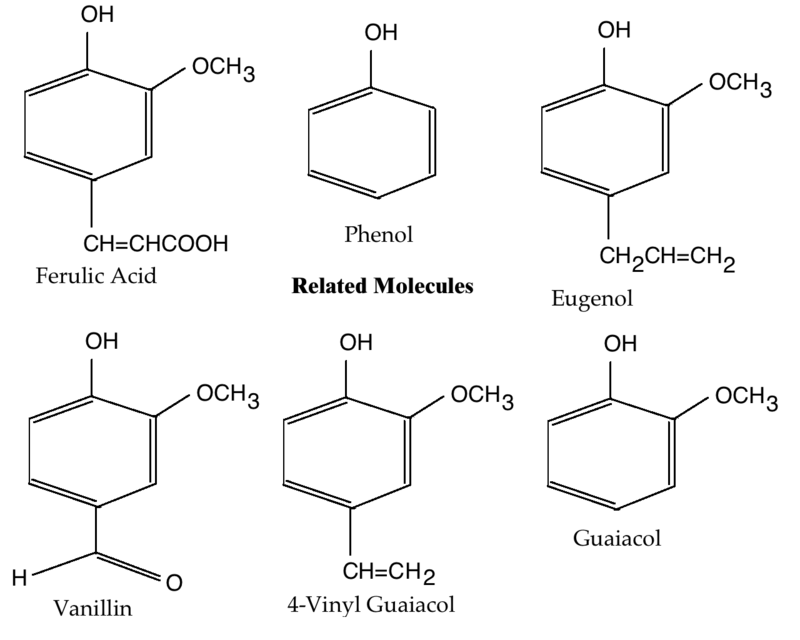 Wheat beers were brewed long before their chemistry was worked out (and, in wheat beer fermentations, there are plenty of other flavor-active molecules derived from the phenolic molecules shown here). However, it’s interesting to see so many flavor-active molecules that appear frequently in brewing and winemaking share similar structures. It’s amazing what a few atoms here and there can do to how we sense certain chemicals. Excellent overview, Chris! This is the most well-described and understandable article on flavor/aroma chemistry I’ve yet to read! Will you be putting out some more information in the future about the chemistry of aromatics? Another great article Chris. This helps explain why I pick up hints of cinnamon and vanilla from some yeast strains. I just finished watching a class on food science and they actually mentioned ferulic acid (always seems like you can go years not ever hearing of something, then you see it 10 times a day). Turns out its also responsible for binding cell walls together in some plants. The plants that produce it will not wilt during cooking- water chestnuts have it, spinach doesn’t. I wonder if you could use plants with higher ferulic acid levels to help boost the clove flavor in wheat beers? Wiki says flax seed has the highest measured concentrations… perhaps some could be thrown in the mash.